Index name: Ro J Infect Dis. 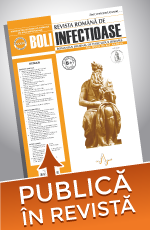 Romanian Journal of Infectious Diseases is the journal of the Romanian National Society of Infectious Diseases. It is a journal with tradition, the first number being published in 1997. Romanian Journal of Infectious Diseases has a high level of scientific content, its main target being the infectious diseases specialist, but it also addresses to persons that are studying or want to be abreast of the news in this domain as well as to physicians in other specialties that sometimes face infectious diseases. The Journal has a peer-review board composed of appreciated personalities in the domain of the infectious diseases and microbiology and its content respects the international standards of certified quality and originality of the articles. 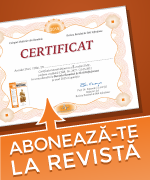 The Editorial Council is formed of recognized personalities from the country and abroad that contribute to the maintaining of the Journal at the highest standards in the Romanian medical field. Romanian Journal of Infectious Diseases is currently indexed in EBSCO (https://www.ebscohost.com/) and is classified as CNCS B+ category. Romanian Journal of Infectious Diseases is in process of being indexed in PubMed.